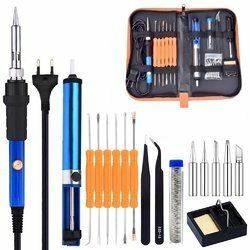 Pioneers in the industry, we offer soldering iron kit adjustable temperature, 28pcs adjustable temperature soldering kit, soldering tools and soldering iron from India. A multi-purpose wood burning kit that meets the needs of pyrograph artists, amateurs, artisans and fine artists. 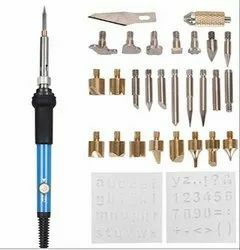 It is suitable for stamping, paper making, hot knife cutting, embossing, formwork cutting, calligraphy, wood burning, leather making, welding, pattern transfer and more. This versatile combustion tool has variable temperature control so you can control the heat required for projects from 200 to 450℃. Suitable for wood burning, welding, cutting and engraving of various surfaces such as veneers and cards. Especially suitable for you with artistic atmosphere. Package Includes: 1 x Pyrography Woodburning Pen 15 x Wood Burning Tips 10 x Solder Tips 1 x Hot Knife 1 x Wood Burning Pen Holder, 2 x Stencils (numbers,letters and basic symbols set). Looking for Soldering kit ?